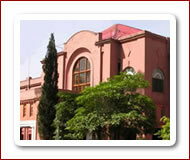 The Department of Physiology is one of the oldest Departments of the University of Veterinary & Animal Sciences, Lahore. Being a very fundamental subject of the Faculty of Biosciences it serves as basis of academic architect. The Department has produced many renowned veterinarians. After the up-gradation of this Institute from College to University, the Department has assumed a wider role. Today, the Department offers Physiology to nine different undergraduate degree programs as well as postgraduate degree in Physiology independently. The Department also enjoys a learned faculty with four PhD and two MPhil.